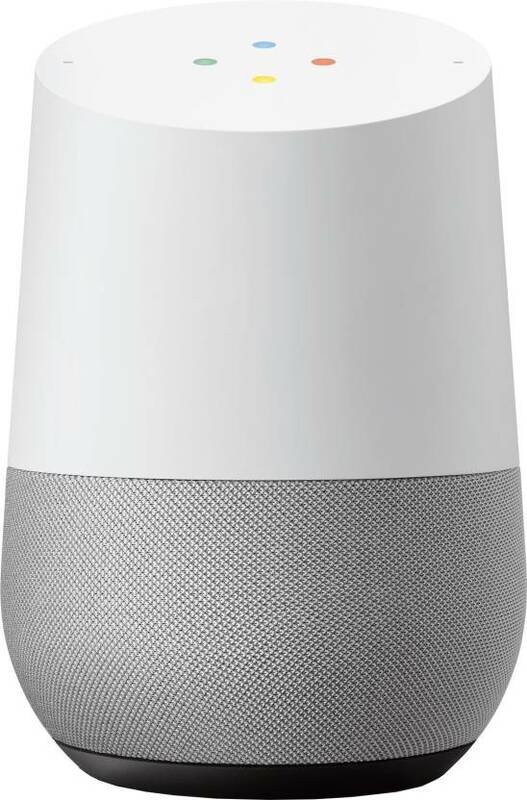 A typical "Monday morning 7 AM"
My digital companion "Google Home" starts playing some soothing melodies and wakes me up with a nice greeting " Good morning Karthik". I refuse to wake up and instruct it to snooze for 15 mins. At the stroke of 7.15 AM, I get to hear the same alarm and I wake up with a half-mind, wishing I had 2 more hours to sleep blissfully, though that never seems to be an option. 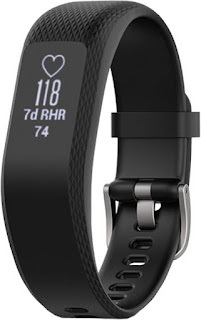 7.30 AM : I glanced at my Garmin Vivo3, a Smart Wearable while I get ready for gymming. The counter shows that I had done only 3000 steps the previous day, out of a possible target of 10,000. Not even half of what I wanted to cover the previous day and I felt motivated to cross it today. I swipe right on the small screen and it says I had a 7 hour sleep with only 4 hours of deep sleep. Again a gentle reminder that I need to increase that by a few more hours. Naturally , I took the recommended option and reached office just in time, along with my Google Home.I head into my cabin and ask my Digital Assistant "What is on my schedule today"? Google Home responds with a list of all the meetings I am supposed to attend . 12PM : I keep my phone in the bag and head for a meeting. A while later, my band starts vibrating gently. I look up to see a notification about an incoming call from a friend. I twist my wrist sideways twice and the call gets declined. I make a mental note to call him later in the evening. 6PM: I head back home after a long day at work. I need some ambient lighting to get out of the sombre mood. 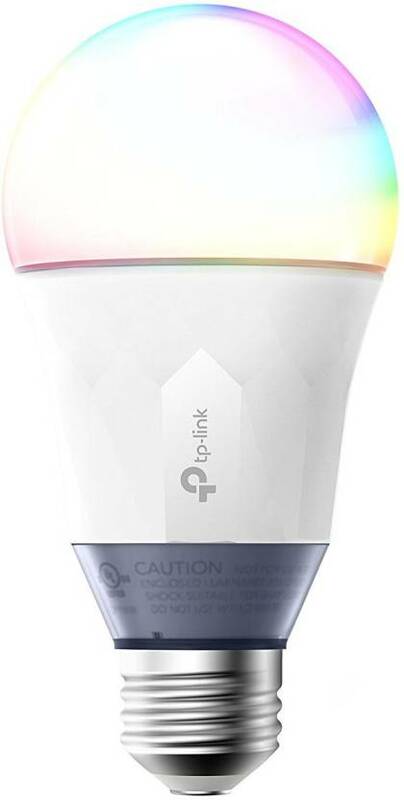 I remember connecting my rooms with the state of the art TP Link Wifi Color LED Smart Lights. A bulb, that can be controlled from a phone app or even through a simple voice command through my Google home . I speak to my assistant again : " Google, dim my lights and make them yellow in colour". In a flash, my smart living room lights dim by 50% and the bulbs turn yellow , perfectly matching my mood. 8PM : I am too tired to cook anything today. I download Swiggy and order some Fried Noodles from my favourite restaurant. As I settle down post dinner, I now think why not make it a "NetFlix N Chill" night. 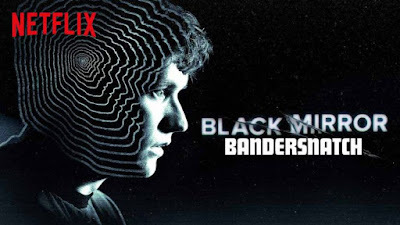 I open the NetFlix app in my Xiaomi 55' 4K Smart TV and start streaming the most popular Black Mirror episode, "BanderSnatch" . Ironically the episode is about a guy's life , who's narrative can be controlled by the user digitally. I then realized, that not only am I presented with options in a TV show but it seems so the case in everyday life itself . Well, who knew Mondays can be so exciting? Incidentally, e-commerce giant Flipkart has aligned itself to the path of Smart homes & Smart Fitness( #GetFitWithFlipkart ) and launched a series of products. 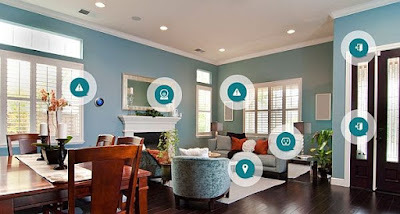 From smart watches that tracks fitness to digital assistants or smart bulbs, a #SmartHomeRevolution is indeed in progress! 2018 has seen a phenomenal rise of Instagram and the emergence of a new breed of "Instagram Influencers". Hence, it's become all the more important to keep yourself updated with new technologies and apps that can help you deliver better content in these social media pages, to guarantee yourself an extra pair of likes and additional followers. The same old boring content with Times New Roman font and default filters available is no longer an option if you want to step into the big game. So here's a quick roundup of some of the best apps you can use to transform your images into a whole different level (and on par with a professionally edited image in a PC). I have classified these apps as Designing, Story/Post Templates for Instagram, Photo Editing and Photo Filters. Canva has been around for quite sometime now , but has upgraded itself quite significantly with a lot of formatting features and new templates as well. 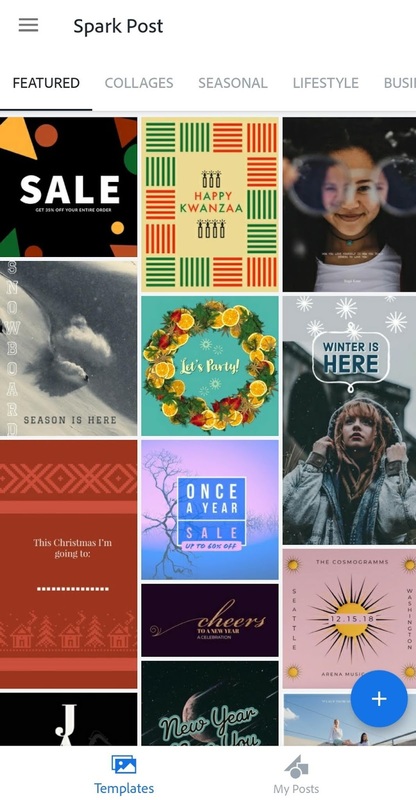 Be it creating a new design for Instagram Post, Blog Graphic, Pinterest Image , Whatsapp Story, Business Card or even an Instagram story, you have custom size templates that saves you a lot of trouble attempting to resize as per the format. 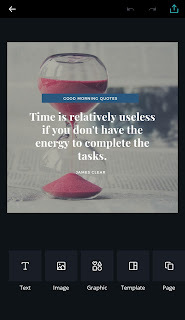 Though editing pictures is extremely limited in Canva , you can use previously edited images to fit into a nice design with an attractive banner/quote in a superlative font. 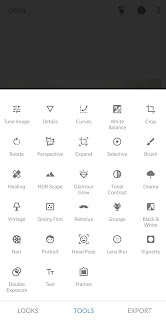 Definitely app of the year for me, this beautiful free designing app from Adobe comes as a huge boon for me. Given I have no experience with Adobe Photoshop, Spark Post got me to designing in minutes. With professional and creative templates, you could easily blend in your pictures with the existing templates and come up with some really nice designs. 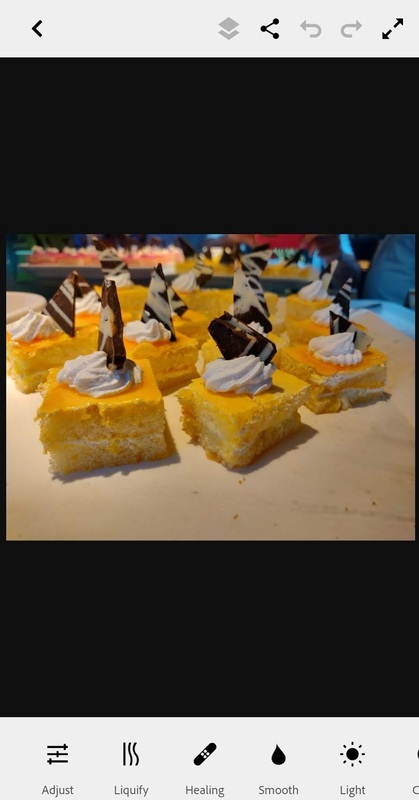 Be it a festival post or a travel post for Instagram or Pinterest, Spark Post is the app for you. There has been a major focus on Instagram stories these days and you get more views than your actual Instagram post. So rather than just adding a picture or a text with hashtag, you can rather opt one among the several designs that Unfold has to offer. (Note. This is a freemium app. The basic designs are free while the other designs are paid). 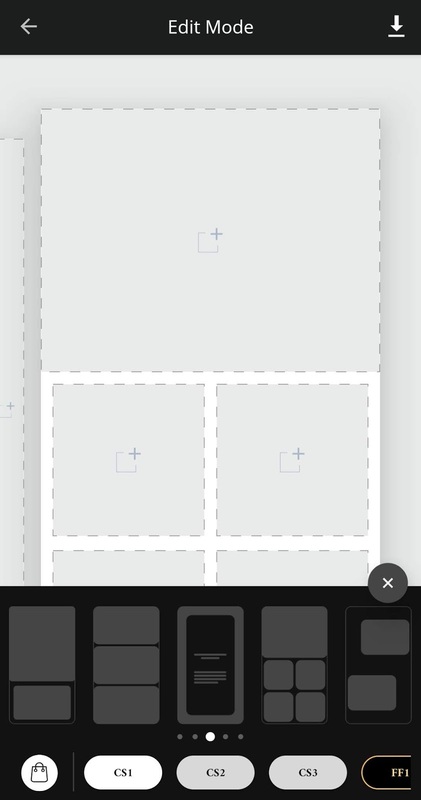 Rather than an individual post, you can try creating beautiful orchestrated grids (splitting a single image into multiple squares ( like 3 rows vs 3 columns matrix or even an image split into 3 pictures across a single row). This enhances the overall Instagram profile too. 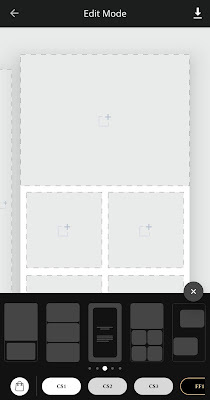 However one drawback is , the minute you begin implementing grids, all your future posts has to be aligned to a single row . Else the below grid loses its structure and goes jumbled, until the current row is complete. Yet another wonderful app from the guys at Adobe, this miniature version of the famous Adobe Photoshop helps you to do minor corrections in your photo in a matter of taps. Be it a glaring tubelight or a red eye or even a sun glare, you can easily "heal"/"smoothen"or "fix" any part of the picture. 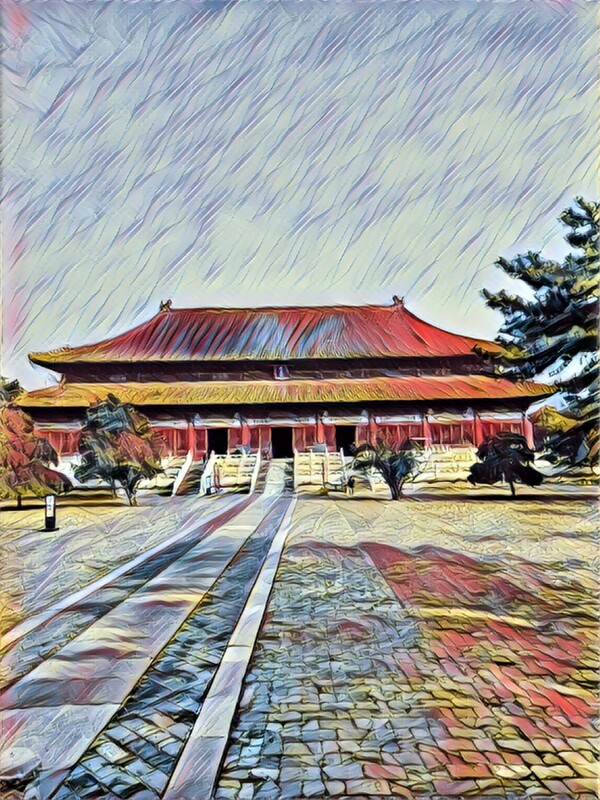 You can apply any part of the background in the picture to a different area in the same picture as well and of course apply other related filters. Definitely a must have app , not just for instagram but everywhere else too. 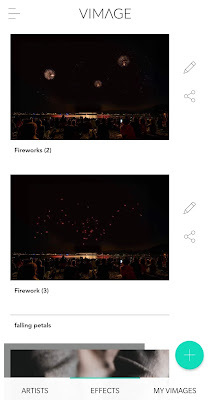 Google's own free photoediting app, Snapseed has a lot of advanced features to fine tune an image. 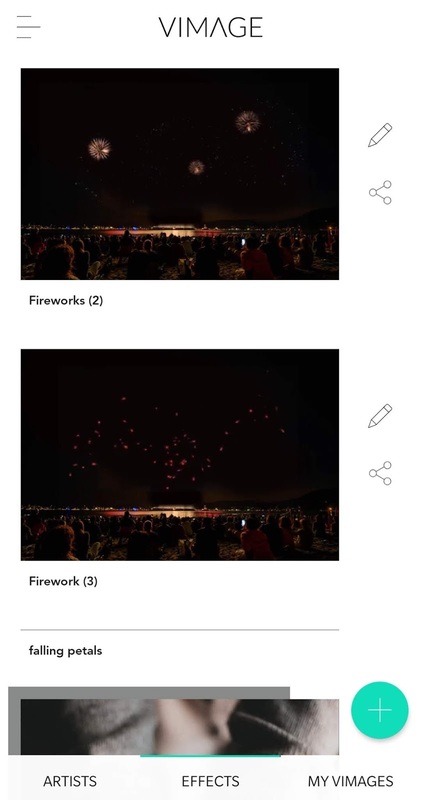 The app is easy to use (though I'm yet to test all the features) and a great tool to do corrections like Shadow, Brightness, Contrast, Highlighting, Cropping etc. Though Prisma was leading when it was launched 2-3 years back, it slowly died down and not used a lot these days. 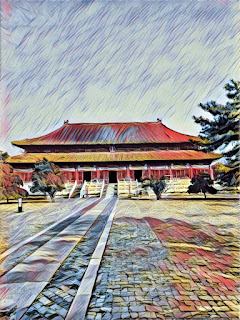 However some of the effects are still very unique ( esp on buildings ) and can be a great app to design your photos in a different way. 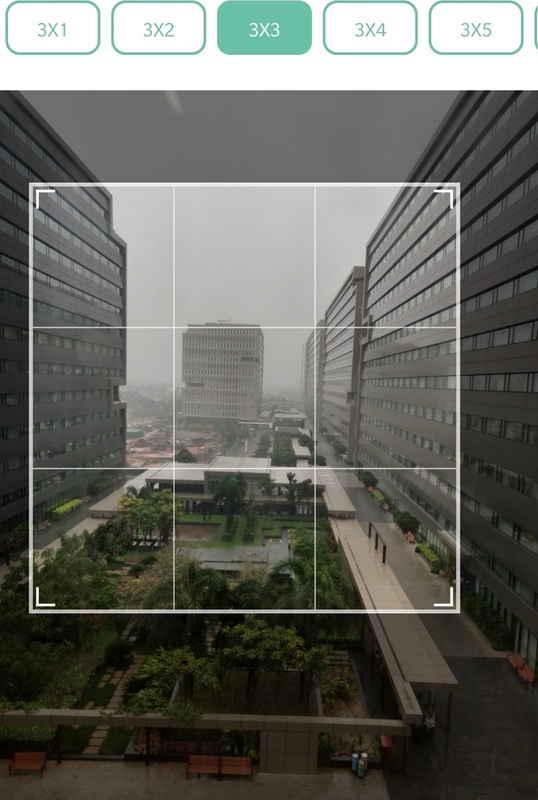 VSCO is one of the most popular apps to apply filters in your pictures. 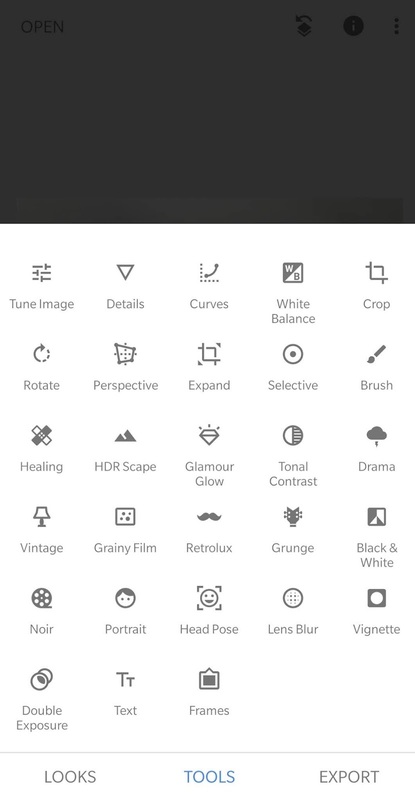 It has more than triple the set of filters that Instagram offers. However most of the filters are paid but it definitely is worth it , given the immense transformation of the image. Definitely recommended for professional photo editors. VImage stands for Video + Image. The app allows you to add moving gifs to your images thus giving a video effect. This includes a small fire burning gif, a passing cloud, fire burning among others. Though its paid if you want to remove the watermark. Vivo India has launched their latest mid-range smartphone , Vivo Y95 in Chennai, Tamil Nadu this week . 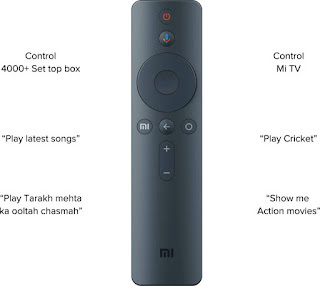 Having made TN one of their focus areas in India, backed by a significant market share in this region, it comes as no surprise that the launch was made exclusive to this region. 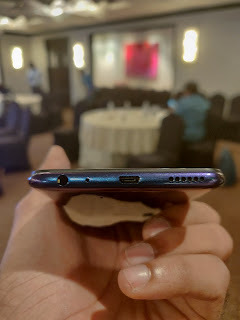 The Vivo Y95 is priced at 16,999 . Priced in the sub 20K segment, this is a significant competitor for other similar brands in this range including Redmi, Realme, Oppo, Motorola and Honor. Thanks to a very strong offline presence, they have made a lot of in-roads in all the three tier categories of cities (Tier 1, 2 , 3) . Known popularly for their "Selfie" , Vivo India has been one of the biggest ad spenders in the entertainment and sports industry, having succesfully campaigned through an IPL tie up. #4 in Indonesia (9%) in the 15-20,000 INR segment. In India, they claim to have a 20% Value share and ranks #2 in Tamil Nadu with a contribution of 7.5% to Vivo's Business. 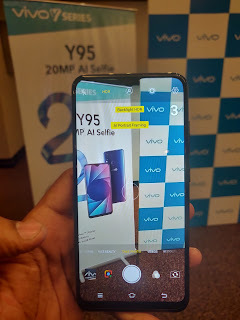 Having a phone already in the 18000 price range being the Vivo V9 Pro , the launch of V95 (as a successor their existing V83) indicated their dual offering strategy. 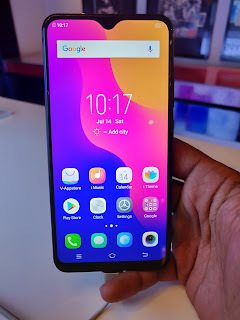 V9 pro was mainly for gaming enthusiasts and people looking for a performance oriented phone , sporting a Snapdragon 626 processor and slightly bigger screen size . Though quite surprising that the V95 comes with a 439 processor( first phone to opt in for the 439) it's claimed by Qualcomm to be a 30% increase in performance from the 430 version. 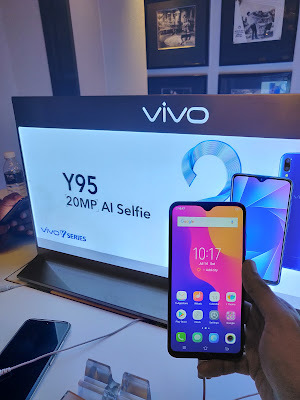 However the Y95 outranks the V9 pro in terms of Camera quality (20mp vs 16mp), battery (4030 mah vs 3260 mah) and of course dual cameras at the back including Artificial Intelligence sensors. 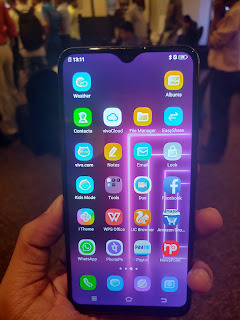 The design is also super sleek with more than 88% screen to body ratio with a barely visible notch. 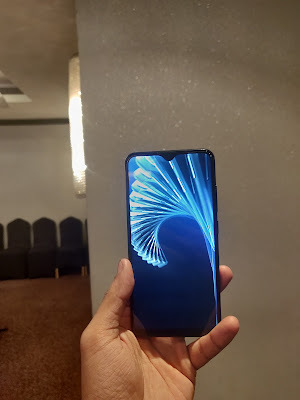 Since I didn't get to use the phone for an extended period of time nor had the time to test its full capabilities, I would not be able to actually comment on the device at this stage though. When it comes to films, language has never been a barrier for me and I tend to watch most of them, thanks to English subtitles. This includes Hindi, Telugu, Malayalam or even Korean and Japaneses. These film industries have produced some of the best Rom-Coms and turned out to be blockbusters. 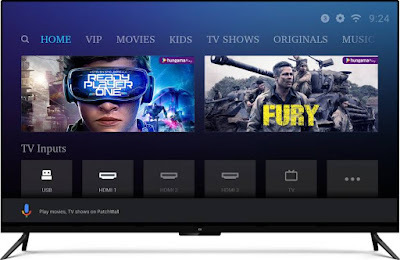 In fact the emergence of On-Demand Entertainment platforms has actually given audience the chance to discover beautiful movies that they may have missed out otherwise. One such recent Telugu movie that I discovered in the ZEE5 platform is Geetha Govindam. This movie was one of the biggest hits of the Tollywood industry, giving a new lease of life to the Rom-Com genre.Frankly it's been quite a while that the Rom-Com genre has been handled so well , esp in the Tollywood industry with such a believable, fun storyline and definitely a great choice for a movie date at home. Featuring one of the most viral hit songs of the year, Inkam Inkam Kavale sung by Sid Sriam is a sole reason why you should definitely watch this movie . Plus you also have the dashing , upcoming star of Tollywood industry,Vijay Deverkonda in it, with earlier hits like Pelli Chuppulu, Arjun Reddy etc. So why would you miss a super hit movie of this star? Also remade as Santosh Subramaniam in 2008, this is easily one of the biggest Rom-Com hits in Telugu. Despite a typical love story of a rich boy meets a poor girl with heavy resistance from both sides, the treatment was simply delightful. Starring Genelia and Siddharth, the humor quotient and some peppy numbers made this a classic. The tamil version was incidentally played by Jayam Ravi and Trisha, though some argue it never came close to the original. A bi-lingual flick starring Anushka Shetty and Arya, this was a runaway success in Telugu with some humor elements and a social awareness plot mixed to it. Full marks to the director though for giving a very different light to body shaming, the ill-effects of illegal weight loss medicines and more importantly showing that inner beauty is what matters. A directorial debut by Rahul Ravindran, the premise of this Rom-Com was based on a blind date set up by the guy’s parents in his own house. 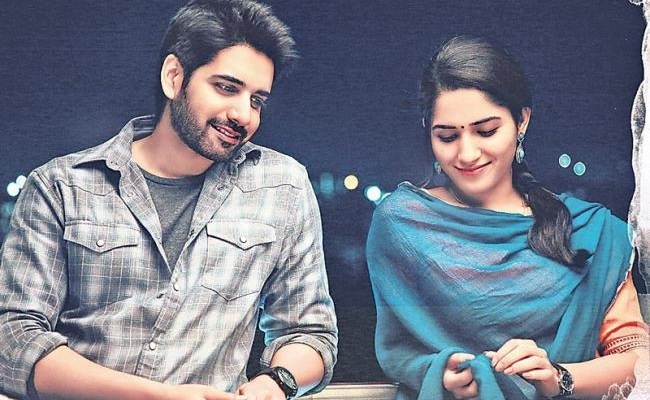 With some mature acting by both the stars, Sushanth and Ruhani , it’s impossible to say that this was actually a debut film by Rahul. With a nice mix of comedy, love and romance , it makes it all the more reasons this film shouldn’t be missed. These films have actually shown why Telugu Rom-comes are signed up for a big amount for remake rights as soon it is made. Almost 70-80% of Telugu Rom Coms made in Hindi, Tamil have gone to become major blockbusters incuding Jayam, Ghilli, Santosh Subramaniam. The above list is only a fraction of the best rom-coms the industry has seen. So what are your favourite Rom-Coms that you feel deserves a remake? Imagine a place where there's no Google, no Whatsapp and no Facebook ! No, we are not talking about BigBoss house where the contestants are devoid of mobile phones and social media. I'm talking about the country of China. One of the world's most populous nations, the country had decided to block all external social networking apps and use only the apps internally developed by Chinese people. So is there a way to overcome this and access them when you are in China? A trip to China needs a lot of prepration compared to any other country. 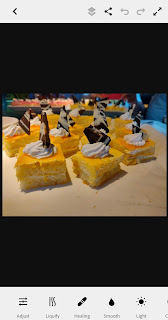 This includes submitting multiple documents for Visa, finding the right hotels near shopping centres and Indian restaurants, planning the right itinerary, converting Indian currency to Chinese Yuan(RMB). But the most important step in planning a China trip is to be prepared on the technical front. Also you can read my China Shopping Guide here . and other popular social media apps you might be using. This is irrespective of whether you are using a Indian mobile number, a Chinese sim or a hotel /public Wifi. Having returned from a 7 day China vacation myself, I had quite the struggle the first day I was there. Then after extensive trials, research I was able to figure out simple ways to overcome the issues. 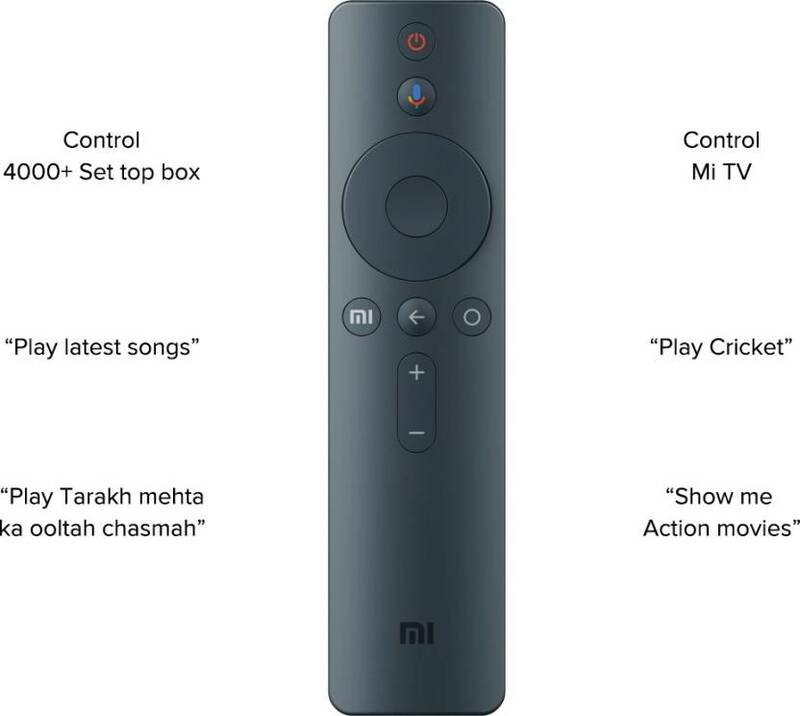 So here's a quick list of apps and plugins you should install, before you start your journey to China. A VPN is a virtual private network , that basically creates a private "Tunnel" connection for your internet. The tunnel reroutes the connection to a different country and hence protects you from any hacks from outside parties. At the same time it helps you to bypass network/ISP restrictions for any website or app.So if you have a VPN installed in your phone / PC and you turn it on, it'll then be able to access a website/app that was earlier blocked by the host ISP. Sounds complicated? Dont worry about any of this. Just download a nice VPN app and you're all set. If you want a professional, superfast VPN ,the most popular choice however is ExpressVPN. 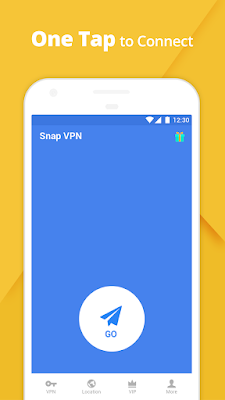 Though this is a paid VPN, you have a free seven day trial period. So register it exactly just before you head for your flight in the layover, so that you have access to it for the entire period of stay. If you want to access the websites in your laptop like Facebook, Google Maps etc, this is much easier than the earlier step. All you gotta do is install a VPN plugin (be it Firefox or Chrome) . One of the popular ones I usually use is Zenmate. 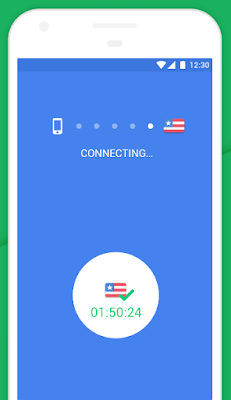 The speeds are great and you even have option to choose the country of connect. The plugin is completely free and you just have to sign up first with your email id. There are plenty of other choices too (though I haven't tested them much). Just search for the same , if you are using Firefox. Though all signboards, metros, roadnames are displayed in English, you might struggle in many places since there ain't much English speakers. Be it at a restaurant, mall or to ask for directions in a store, they simply give you a blank stare when you ask a question in English. 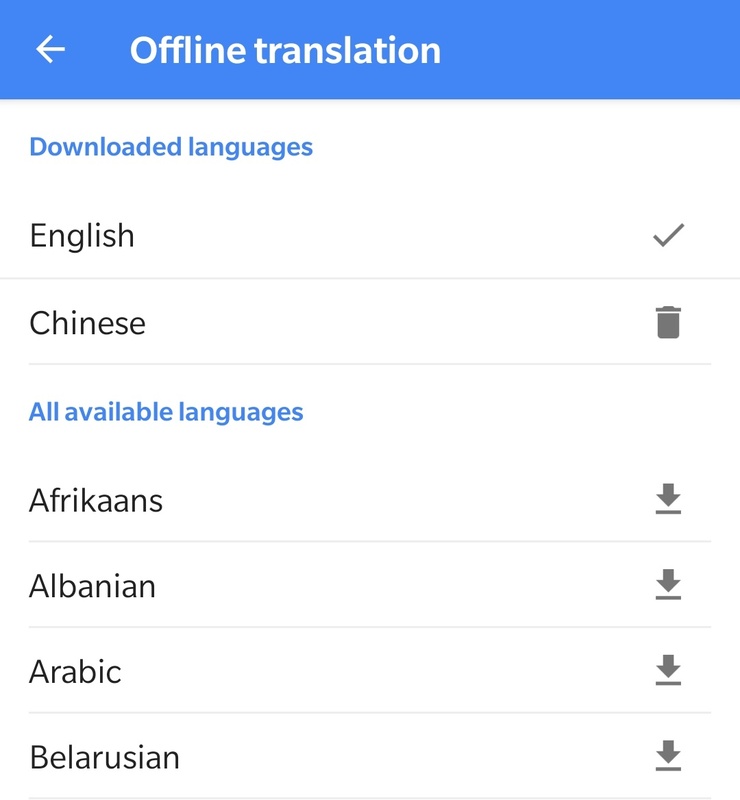 The best option is to use Google Translate app . 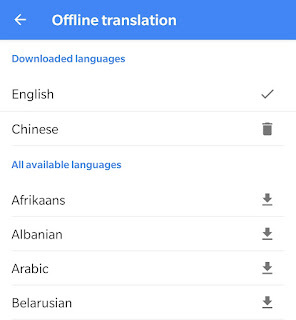 Do ensure you download the Chinese language so that it can be accessible offline too. 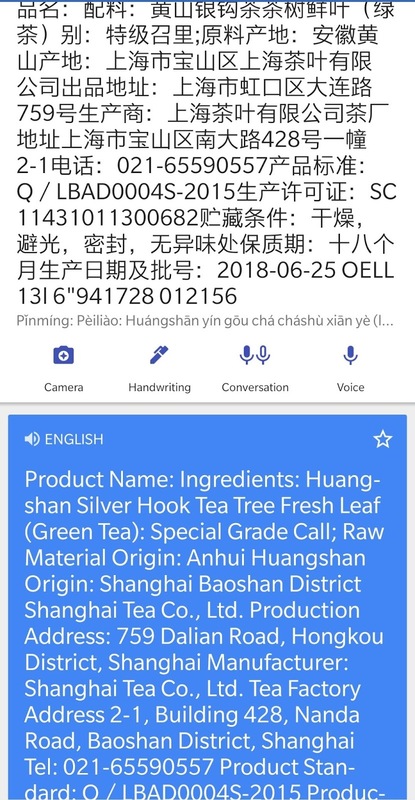 Scan text written in Chinese in products at food stores using the camera option inside the app and it translates the whole thing to English. 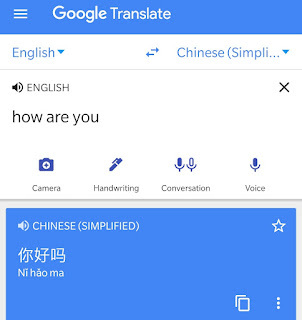 Record conversation in Chinese and translate it back to English (and vice versa). 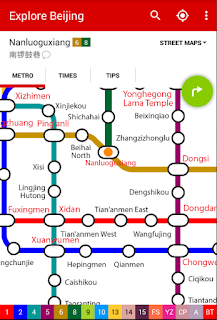 The best and the most economical way to travel in China is the subway (Metro). 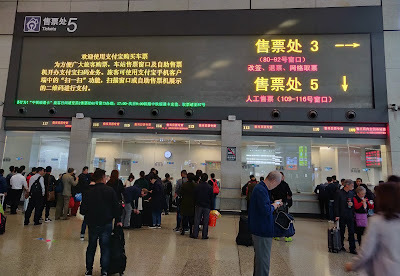 Though the network is very extensive and more than 15 routes , esp in Shanghai and Beijing, it can be easily navigated. All you need to know is your destination station and you can easily trace the route no you need to take. A very handy app is the Explore Shanghai , Explore Beijing apps. 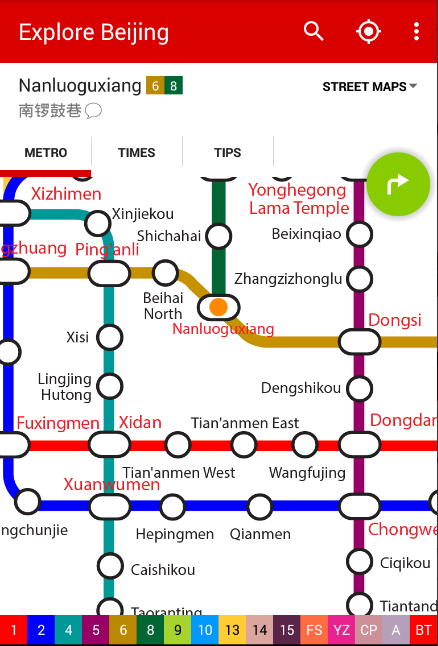 It displays the metro map in a clear mobile friendly version and works without internet. Having used the subway/metro at least 5 times each day in my trip, this was extremely useful and I became super dependent on it. 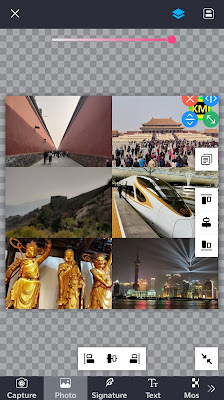 Well, technically not an app but trip.com comes in handy to book the bullet trains between the different cities in China. Or you can also book through https://www.travelchinaguide.com (I used this for my bullet train booking). Many sites might recommend you to use WeChat Pay (which is pretty much used in every single store) or Baidu ( Google Alternative). But these come with limitations. 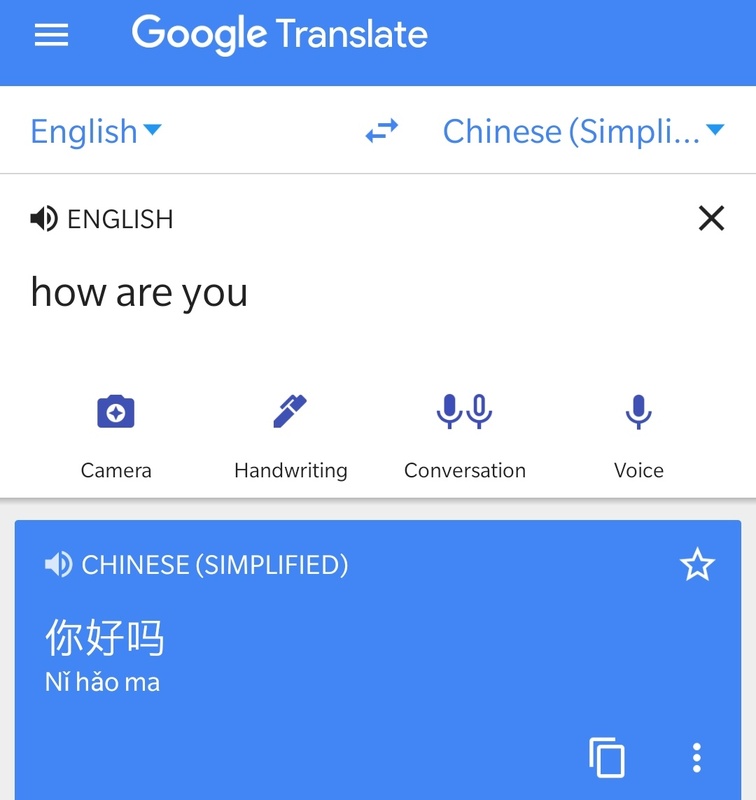 You need a Chinese account to load money to Wechat money and also need a Chinese person to introduce you to Wechat. 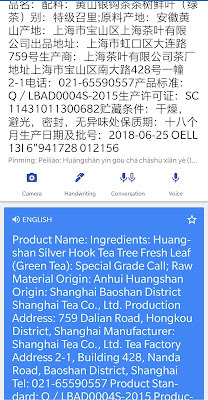 Almost most of the content in Baidu is in Chinese and it's very difficult navigating it. So it's always better to use our comfort Google apps through the above methods. 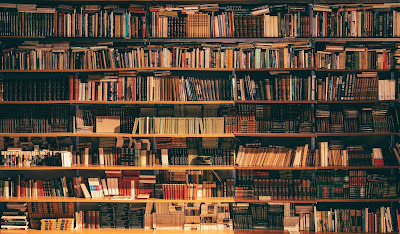 There is something fascinating about books , carrying an unique old world charm , a power to transport you to a different reality, an alternative universe that makes you live with the characters. For some people books are just a hobby to while away their time, but for some it is their passion and share a very close bond with it. I probably may have spent countless of hours in libraries and bookstores , going over hundreds of books yet never got bored of it. The last decade however has seen a complete shift in the way books have been consumed. There has been a gradual adaptation of large screen devices , be it 6+ inch mobile phones, iPads and even e-book readers like Kindle. People have begun to prefer to buy an e-book online and read it on the go easily, be it in a car, train or flight. Yes, there are also traditional people like me who would still any day prefer a hardcover book than an e-book. 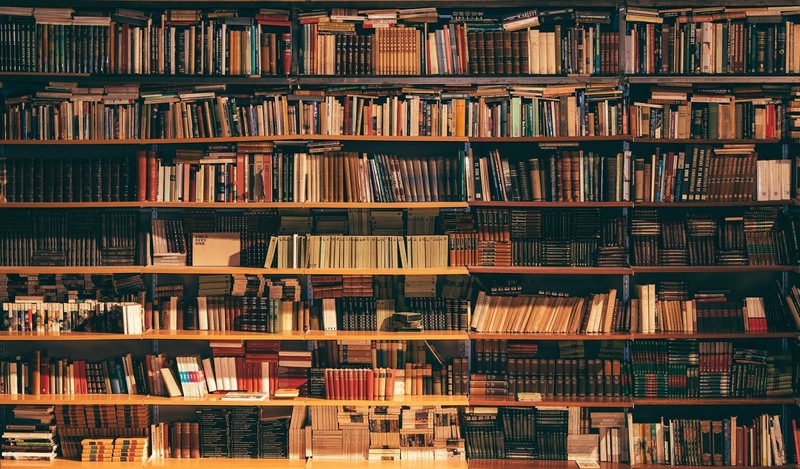 The digitization of ebooks has impacted a lot of libraries and book stores in India that has struggled to keep up with the pace of technology and modernization. However there are few places that has seen the change coming, evolved into something completely different and at the same time retaining their core values. One such place is British Council. I'm pretty sure, most people in Chennai with a love of books would have at some point associated with this place. 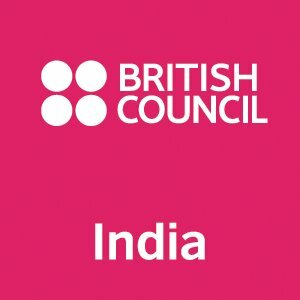 An international organization, British Council was launched in India , exactly 70 years before. Starting as a place meant to promote English education, they setup a major library that stocked thousands of books of every genre. Ranging from fiction, non fiction, management books, comics and even English language books, there was almost everything you could find in a British council library. Adapting quickly to the technological demands of the industry, British council has now become a cultural centre, that allows exchange of ideas, networking and a place of learning and cultural activities. In short, a great place for millenials to hang out. Being physically present at the venue may not always be easy thanks to tough schedules and work appointments. So instead you can just login to their site and have access to more than 115,000 books and 14,000 journals across a wide range of subject areas. A wide range of Academic e-books are also available in the same site that offers access to Management, Humanity, Engineering subjects. This digitization of books and giving access to 30,000 of its members is a major step in embracing change and at the same making resources available in your own device any time anywhere. This step makes sure that though the consumption pattern of reading habits is shifting from physical books to e-books, the habit of reading remains unchanged and would carry on to the future generations as well. 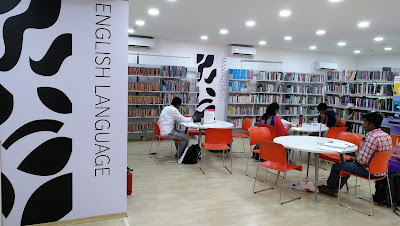 British Council is not just a place for reading and hanging out , but also a cultural centre for learning. In accordance with it, they conduct a lot of events for students & professionals as well . This include writing & film workshops, thematic events. You can attend film screenings , get your camera skills sharpened at a photography workshop or even understand the world of automation by participating in the robotics workshops. 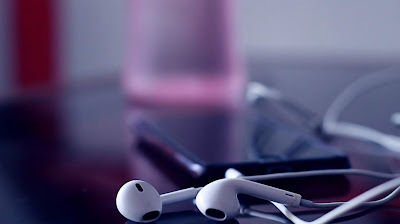 Books can not only be accessed in the phsyical hardcover versions or the e-readable digital form but also available as an audio file. Similar to a mp3 file , books are also getting converted to an audio book or in some cases as a podcast. So all you gotta do is plugin some headphones, download the audio book or stream the link on to your device and get the file playing. The remarkable transformation of British Council at the right juncture is a great indicator for other related institutions to follow suit and become more relevant in the fast paced technological world. From a library to a cultural learning center, it has set a great example for this industry. My style of fashion has always been confined to readymades, picking up that jeans (predominantly a shade of blue) and a casual T-Shirt (most probably a plain colour) . The occasion would ideally be for a birthday, Pongal or for Diwali. Occasionally I pick up a dress that's available during a sale in Amazon/Flipkart. Thanks to a "Everyday casual wear" policy at work, I have never really bothered to get a good collection of Formal shirts and pants. My style, lately has however been shifting towards a more formal attire, thanks to some solid advice by my good friend. I even managed to get a nice pair of formal shirts for my birthday and I haven't ever been more convinced. Power dressing indeed. So that basically took off as a tipping point to start leaning towards wearing a formal or atleast a semi-formal attire more often. 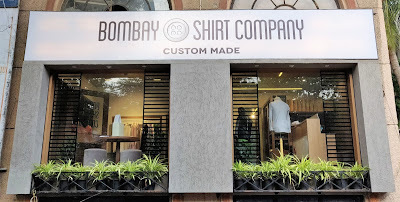 This was when I discovered a Customized premium Shirt Store called The Bombay Shirt Company through a friend. Since it was situated close to work in Adyar, I thought of giving them a try and see how a fully customized shirt might look like. The results were pretty fantastic. What can you customize in a shirt? 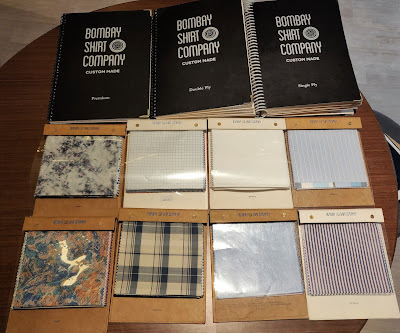 Well if your guesses are just size and design, you might be pretty shocked at what Bombay Shirt Company can offer. The no of customizations is 20+ including Fabric, Weave, Pattern, Collar (Style , Contrast,Stiffness) , Buttons among others. 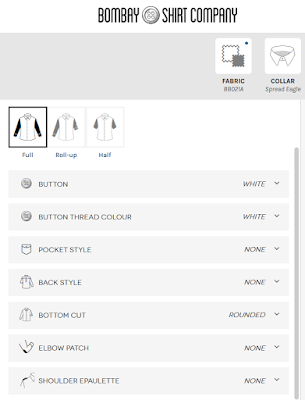 Listed below is the step by step process of the shirt customization at the store. As soon as I began , I was handed a iPad that asked me to choose an option for each customization offered. 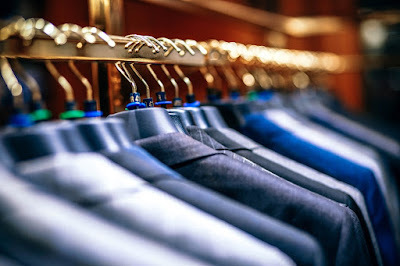 An executive beside me the different options and how I could go about choosing the ideal shirt for myself. It all begins with a Fabric Selection . 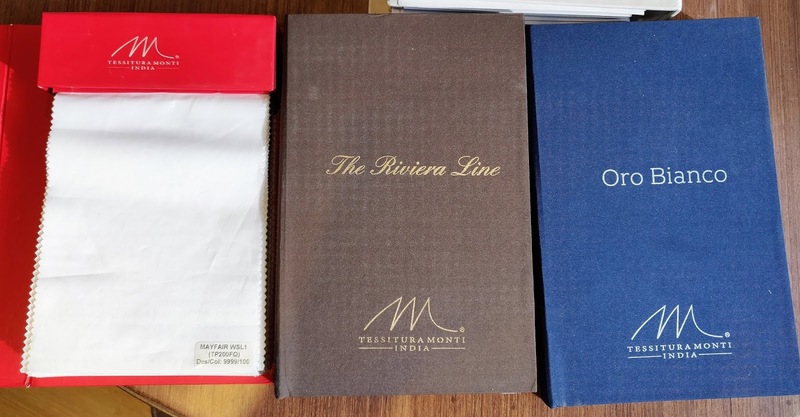 This includes Single Ply, Double Ply, Premium, Italian Fabrics, Japanese Fabrics among others. The single ply shirts are the cheaper options and starts from 1990 INR. The composition of this fabric includes Cotton, Linen, Tencel, Egyptian Cotton and Denims. Next you choose a colour. You can be spoilt for choices here, as they pretty much have multiple shades of every colour. So if you have a specific colour in mind, high chances are that you can spot the exact one here. Colour is followed by Pattern selection. You can choose from a checked pattern, striped pattern, Desginer prints and of course finally the standard solids. Once you are done choosing the fabric, colour and pattern of the shirt you head on to the collar portion. If you think this is a relatively easier option was , you are once again mistaken. Turns out there are 5 types of customizations to be done in the collar portion alone. Collar Style has the most options including Spread Eagle, Madmen, Prince Charlie, Club, Wing and many more. 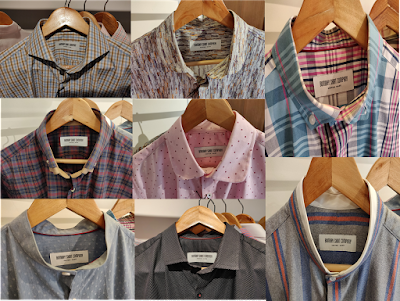 Spread Eagle is the standard collar that's available in most shirts, while the Evil Pandit Collar is the one Pandit Nehru wore and been quite a style statement among many. 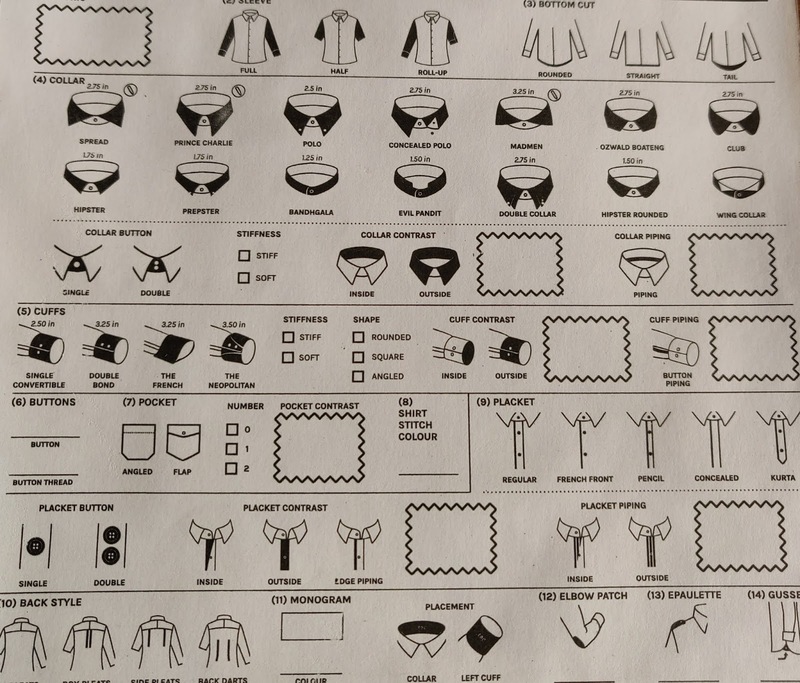 You also get to choose among a few options for each of these collar parts below. Though not immediately noticeable at first glance, the cuff style also plays an important role in the overall look. The options include the standard Single Convertible,, Double Bond ( Just like a James Bond Suit). My most favourite part of the customization was the monogram. 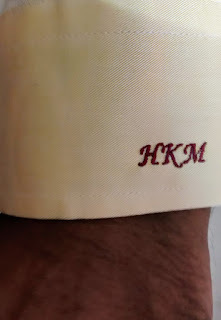 You can get to have your initials (upto 3 letters) stitched on the cuff or the back collar. Placket is the portion that covers the portion of the buttons. You can either choose to make it as a no background or a regular double lining or even a slim pencil version. 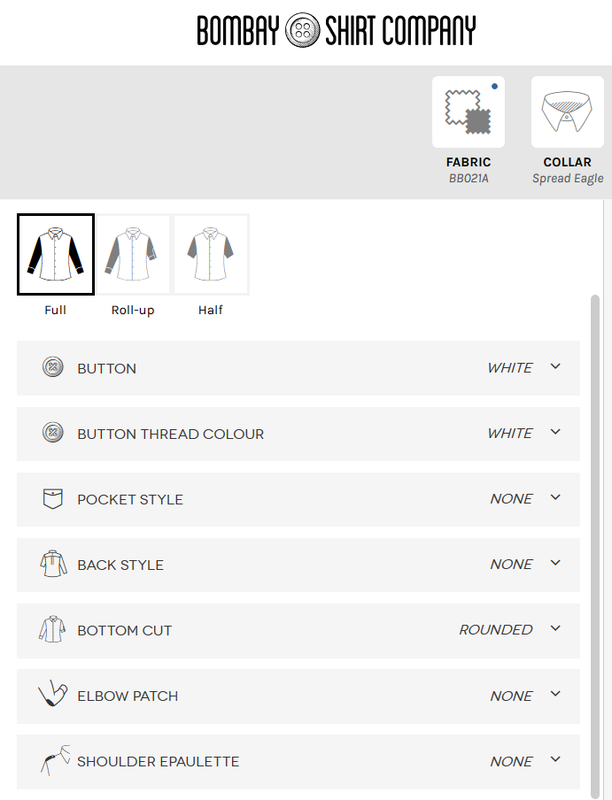 The overall customization roughly takes 30 mins - 1 hour depending on the time you take to choose a colour and design. 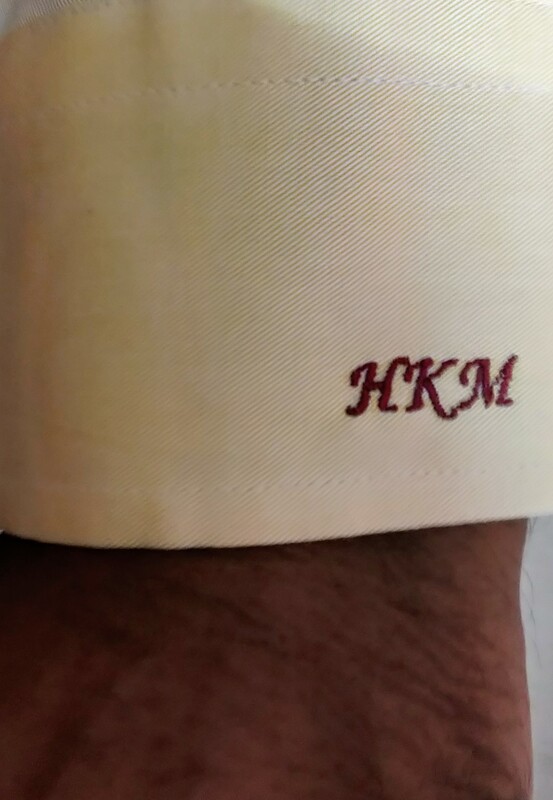 The shirt I customized was a creamish yellow colour, single ply, a regular placket one, a monogram with HKM as initials, blue buttons, a slim fit on the arms and a few other customization. With a tailor to assist on the sizing options, the actual fit was almost perfect, exactly to my preferences. The chosen colour was spot on(exactly as shown) and I loved the fabric thickness as well. The overall price was 2200 including taxes. The delivery time of the shirt was less than 7 days, and this is great,given its manufactured as a single piece entirely on the mentioned specifications. Some of the blends and designs available is very unique and I could see some beautiful intricate designs that I haven't really observed in the usual fashion stores like Lifestyle/WestSide/Shoppers Stop etc. 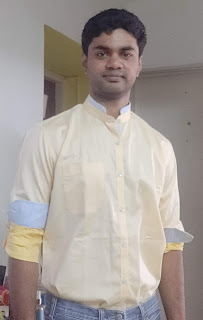 On the whole, with a fair pricing range of 2000-5000 INR (given its a premium blend with 20+ options custom tailored shirt), this definitely would be my primary choice to pick up a shirt for any planned special occasion. In case the fit is not per your liking or slightly different, you get a free replacement or you can also get the shirt altered directly in the store, if its a minor issue. The only downside is that the general promised time for a delivery is generally 14 days for the second time order and this may not work for you if you are in a big hurry.